With an Origin Premier subscription for $15 a month you can start playing the full game on PC on February 15. If you only have an Origin Access subscription for $5 a month you can start playing on February 15, but only for 10 hours. You can also do that on Xbox One with a $5 a month EA Access subscription. Everyone without some sort of subscription, or if playing on PS4, will have to wait until February 22 to start playing. This isn’t a new trend for EA, or other companies, but it’s certainly becoming more common and more complicated, especially as its subscription service tiers multiply. Things like EA Access, Origin Access, and even Origin Premier can be great on their own, providing a way for people to try out different games from an expansive library of demos and back catalogue titles available to all subscribers. When they become tools for further stratifying the audience for a particular game, however, they mar a game’s launch. 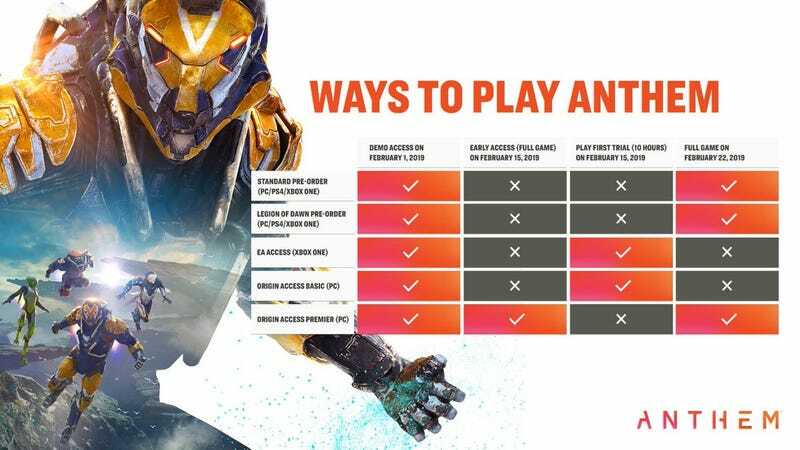 If EA is using early access to get people to spend money on these services because selling Anthem for $60 isn’t profitable enough on its own, an easier way might just be to charge $70 and let everyone start enjoying the game together at the same time, no charts needed. Earlier today, one player tweeted at the Anthem Twitter account and asked why players on PS4 didn’t have any options for getting a head-start like everyone else. Jonathan Warner, the game’s director, responded by saying that EA Access not being an option for PS4 owners is out of BioWare’s hands and strictly negotiated between EA and Sony. “If it were up to me we would ALL play on the same day,” he wrote. Correction: An earlier version of this article implied Origin Premier subscribers also need to buy Anthem separately to play early. Access to Anthem is included as part of the Origin Premier service.